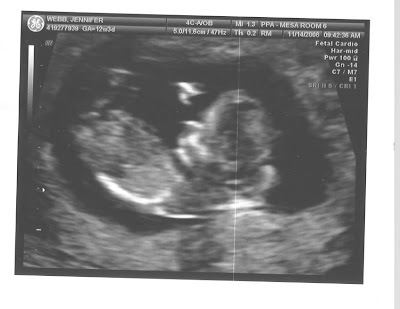 We had our first trimester screening ultrasound this morning. All good news - yea, God! (Just in case a little guidance is needed: Peanut's head is on the right (you can see his/her nose pokin' up), the white spot floating above the middle is a hand (Peanut's waving...what can I say, he/she's social), then his/her little body curves around the bottom to the left, with legs and feet barely visible high on the left.